I will answer that very important question later. My wife and I are creating what we hope will be a sanctuary for birds and butterflies in our back yard. We have purchased some really neat things at Wildbirds Unlimited. If you have never visited one of their stores, you should try it. They have feed, houses, feeders, books, etc. We have also purchased some plants that will hopefully attract birds and butterflies. Why are we doing this? Well, the acceptable answer would be, “Because we care about the welfare of all living things.” And that is certainly a big part of our motivation. The other, more selfish part, is that we enjoy watching them do their thing. So, the more of the creatures we can bring into our environment, the better the entertainment. For instance, we purchased a hummingbird feeder that had three feeding stations, hoping to see three hummingbirds feeding together. Well, that didn’t happen. The fact is that hummingbirds are very territorial, and will seldom share sugar water with one another. They will spend a lot of time and energy chasing each other away from what they consider to be their very own food source. So we bought five smaller feeders and spaced them far enough apart, so now we can observe several birds feeding simultaneously, but at different locations. Have you ever watched hummingbirds chase each other? It is like watching the aerial combat scenes from Star Wars. They are so fast, it is hard to keep up. We have also added new bird feeders to our back yard. Our previous feeders were in front of our house, where they were not easily observed. Plus, the squirrels had ready access to the bird food. Now we have squirrel proof feeders in a location where we can see the birds. Oh, don’t get all teary-eyed about the squirrels. We feed them under the big pecan tree. They are not starving. 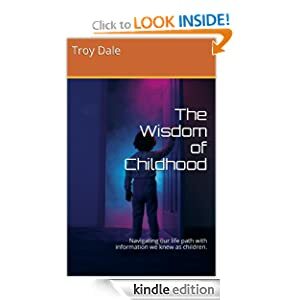 So, what is the answer to the burning question in the title? If you are talking about butterflies, the answer is chrysalis, not cocoon. I have lived for many years not knowing that fact. I always referred to the metamorphosis stage of butterflies as cocoons. Cocoons are a silk covering that some moths spin around their chrysalis, but not butterflies. 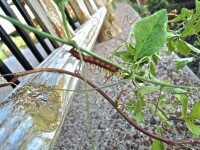 The butterfly caterpillar sheds its skin many times as it is growing. The last skin it grows when it is full grown is a hard shell, called a chrysalis. Inside this shell, the caterpillar liquifies, and reconstructs what will become a beautiful butterfly. That’s a very simplified version of what happens, but simple is what I like. What makes caterpillars and butterflies so interesting to me is the fact that they have a “destiny” of sorts, and will do what ever it takes to fulfill that “destiny.” If you have not read the book entitled Hope for the Flowers, by Trina Paulus, do yourself a favor and buy one on Amazon. It is a wonderful tale about what happens if caterpillars don’t understand their purpose in life. The message is powerful. Oops, gotta go! There’s a hummingbird chase happening outside my window. All photos by Regina Dale. 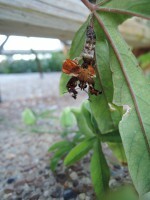 This entry was posted in Natural World and tagged Amazon, butterflies, caterpillars, Chrysalis, Cocoon, Hope for the Flowers, hummingbird, moths, squirrel, Star Wars, Trina Paulus, Wildbirds Unlimited. Bookmark the permalink. 8 Responses to Cocoon or Chrysalis? When I lived back east, we had a fairly large backyard and had three bird feeders, each with three “stations” on them, along with suet cages. All were squirrel proof, too. It was always pleasurable to watch the birds come to the feeders. But man, those little creatures sure do consumer a lot of bird seed. We were refilling those feeders at least once each week, sometimes more often. And our trips to the store for more bird feed and suet ended up setting us back a pretty penny each month. We never did get hummingbird feeders, though. 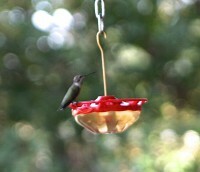 Hummingbird feeders are much less expensive to fill. Just mix sugar and water. You certainly have added to my erudition. Like yourself, I also wondered about the distinction between the two. As you might quess, we too, are creature feeders … particularly during our Chicago winters. You can actually see the birds in the morning with their feathers all fluffed up and huddled together waiting for feeders to be filled. The sound and activity is like a farmer’s market. It is always rewarding to help feed and protect nature’s wonders. I have to say the downside to this is that we have to say goodbye to some of them as they migrate. I cleaned out the Purple Martin house yesterday and once again was amazed at their ability to build such wonderful nests. The good news is that they will return soon, because they know a good thing when they see it. 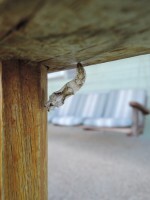 What an entertaining, informative post — until I read it, I didn’t know the difference between a cocoon and a chrysalis. My husband and I have done the same things in our yard as you and for the same reason, the fun of watching the creatures that wander in to check out our offerings. In Colorado, bee balm is one of the best-growing plants for hummingbirds. They work it steadily. Loved the photographs. Thanks for sharing, and thanks for the comment.